In case you have been living under a rock, tacos have been having a bit of a moment here in Austin, Texas. Bon Appetit has even declared that Austin has the most dynamic taco culture in the country. With hundreds of tortilla and filling varieties to choose from, selecting the best taco in town is a controversial declaration that we will not be a part of. Here at Visit Austin, we like to celebrate the taco in all forms, and will be bringing you a list some of our favorites for every meal. Flour or corn? Beans or papas (or both)? Don&apos;t forget to top things off with a Topo Chico. Indulge at your own risk. El Chilito - Is like the cool little brother with a lot of personality to the equally tasty and associated El Chile Caf y Cantina. Try the Vegetal and Rajas Con Hongos- you&apos;ll thank us later. Hecho En Mexico - Aside from everything being delicious, this interior restaurant boasts a 99% gluten-free menu and a large variety of vegetarian dishes. Check out the tacos Puritito Monterrey with a side of chipotle cream sauce. La Fruta Feliz - Andrew Knowlton names the barbacoa de chivo the best taco in Austin. Its hard to disagree. Just off Manor Road, these tacos are a delight meal-round, especially on corn. Also worth the calories, Torchy&apos;s Trailer Park Taco (be sure to get extra trashy). Photo by Aimee Wenske. 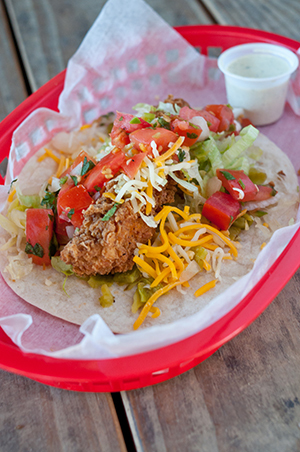 Torchy&apos;s - There are a few taco shops that are going to have to be featured more than once in our taco roundup series. Torchy&apos;s is one of them. For dinner, try the Beef Fajita or Crossroads. Or get crazy and pretend you know what to order off of the secret menu. Gluten-free and vegetarian-friendly options are available, and life isn&apos;t worth living without trying the Mexican Street Corn. La Condesa - A fancier spot downtown, one may overlook the modern interior tacos found here for other street-taco fares. Don&apos;t be fooled- the carne torcida and pescado tacos are worth the possible wait in line. Bonus tip: try the guacamole sampler. Veracruz All Natural - Since 2008, this food truck has expanded to three different spots on the south and east sides of town. The chicken mole and al pastor are delightful and cooked perfectly. Try things with the works. El Alma - laid back and delightful, these tacos are homespun off of the flavors of Mexico. The Pato taco features roasted duck, and the Lamb Barbocoa is worth all of the things. Taco Flats - located on Burnet Road, this taco joint was re-established from its original hey-day in the 70s. Try the Pirata taco for cheese grilled to the tortilla, topped with beef fajita. Peached Tortilla - steering a bit away from traditional, this famous food truck sports banh mi, crunchy fish and pad thai tacos from its floating lunch food truck. Its worth the wait to see what the fuss is all about. Papalote Taco House - located off South Lamar and open late, this hot spot serves tacos &apos;til 10 p.m. For some creative bites, try the Tinga de Res or Hongos y Epazote to get the evening started. What&apos;s your favorite taco in Austin?